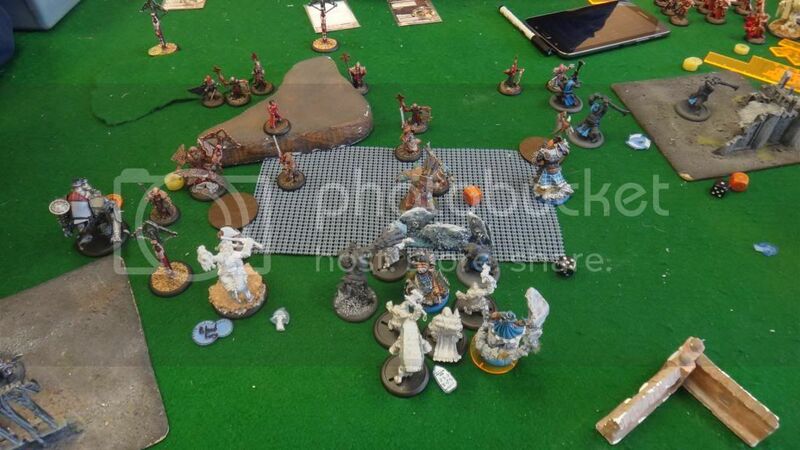 Saturday, I was lucky enough to land two games against Menoth. 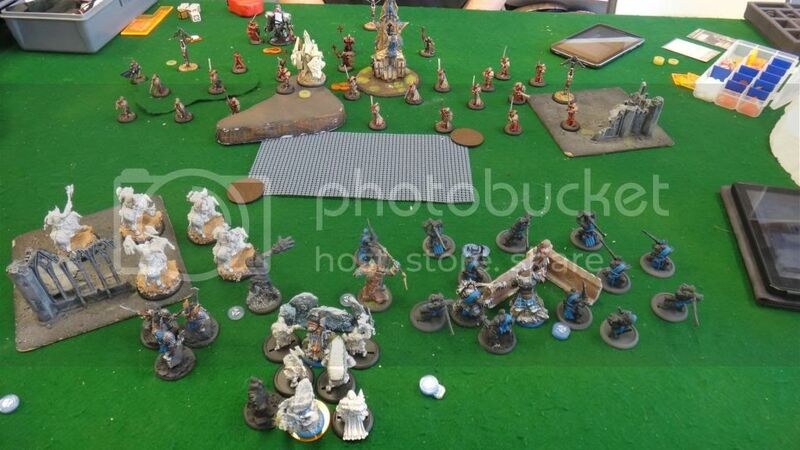 I don't get to play Menoth very often, so I had no idea what to bring, except Pyres. The problem is that I never bring Pyre Trolls, so I didn't want to metagame. My lists, therefore, stayed pretty much the same. My opponent brought Reznik1 out, and I dropped eMadrak, because... that's what I do. Incidentally, when you see Reznik, it's not the original model, it's been modified, and actually legitimate, not the miniature armored dude the regular model consists of. It looks good. 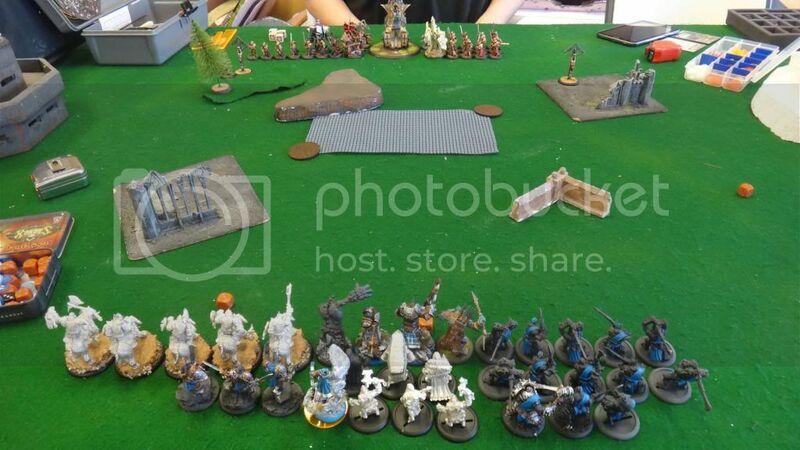 In fact, my opponents whole army looked legit. 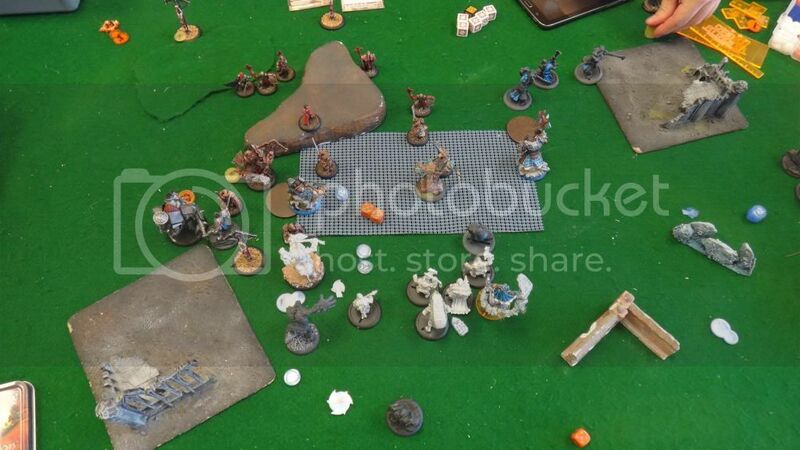 Anyways, as I said, I rarely play against Menoth so Reznik is new to me. His feat isn't bad though. Strips all fury/focus points, applies fire to someone who casts spells (E.G., Runeshapers, TAC, etc), and doesn't allow focus allocation. Against me, it will strip the fury off of my beasts, I'll lose my upkeeps, and I'll have to cut my caster for fury. Not a big deal. In fact, in the right circumstances, him taking all the fury off my beasts is kinda cool. I imagine all of these full-blooded dire trolls charging around and then Reznik reads his stuff, and suddenly, they're less mad I guess? The other neat thing he does is when he kills a model, he creates a wrack right there. His spells are Engine of Destruction, which boosts his SPD, STR and MAT for a round. Ignite, +2 damage and crit fire. Hex blast, a ranged AOE that clears upkeeps from a unit. Iron Aggression, boosted melee and free charges for warjacks. Perdition, a ranged attack that if it damages a model, a warjack may make a full advance. Cool. I won the rolloff, and he elected the side of the map he wanted. We actually did a scenario, but if you've read any of my batreps yet, you know that 9 times out of 10, I completely ignore the scenario. It's not that I'm trying to, but in the case of this scenario, we have 2 melee monster casters smashing into the middle ground. By the time either of us gets close enough to dominate, the other has charge range. It's that simple. I think that's right. I don't have Menoth on my Warroom yet to add up the cost, but I think that's it. So, first off, I made a huge mistake not bringing the Chronicler, or the Fell Caller. I realized I didn't have room for it with the Long Riders. I think in the future, I'll be dropping the Sons of Bragg because A) They're a Character unit, and B) don't particularly need Madrak's help to be good, and C) They're in my pGrim list too. Secondly, I really like the Storm Troll I normally have in this list, but I had a point extra so I took the Axer for feat. He did ok, but I missed my Storm troll. However, when I get Horthol, he'll replace the Stormtroll entirely, so there's that. Thirdly, I found out that Janissa is not a small-based character. When I got her used, she was already glued to a small base, so I just assumed that since she was a petite as trolls can get, she got a small base. It was really nice too because she could be right near madrak (outside of grim salvation), and not block line of sight to him. No more. But I'm glad someone pointed it out. So, we deployed. I put Fenns on the right, Long riders on the left and beasts right down the middle. Sons of Bragg go in the back as a second line, end-game piece, and an awesome unit at clear up jams for my Fenns. He put his jacks to my left, and Exemplars everywhere. Remember, there's three units, so he puts one to the left, and one to the right, then carefully mixes the third one up in the middle, setting them up within the other units so everything's in CMD, but so I can't really kill a whole unit in a turn. The Vessel goes on my right to cause pain for my Fenns, and support most of the Exemplars. Apparently, the Vessel can martyr or something, a model that dies in it's CMD, and cause it to hit back before it dies. Which is legit. It's like immediate Vengeance. He also places his wracks, spreading them out all over the place. I lead off. I do some math on the Vessel of Judgement (which has a ranged attack) and go forward with it. Moses puts Harmonious Exaltation on Madrak for a cheaper spell. The beasts run forward, riling up to 5 fury between the 3 of them. 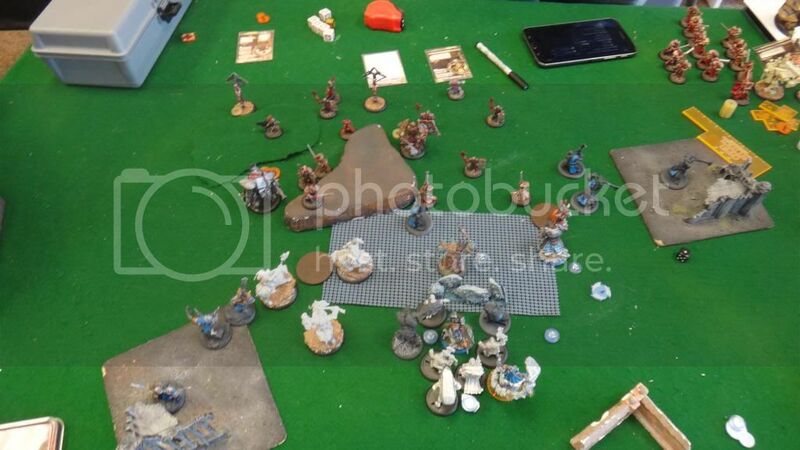 Madrak puts Blood Fury down on the Fenns for 1, dumps the rest to the stone, and moves up, KSB moves up with him, pops aura, and for a change, tells Menoth NO to fire and stuff. Felt good. Janissa moves up and completes the kodiak moment with a wall. The Long Riders run, and the Fenns run. They're DEF10 now with Blood fury, but I'm hoping I mathed well enough to keep them safe from the Vessel for a turn. It's got a RNG12 shot that essentially electro leaps d3 times to the nearest models. Not like chain lightning, which is... you know, a chain, but all 1-3 strikes originate from the first target. The More you Know. The Sons of Bragg move up, and I believe that's it. Oh, the Kithkar runs up behind the Fenns. In reply, the horde of Exemplars runs forward. Remember now, there's three units. marked by red, white and black skirts (ha), and the red ones get Ignite from Reznik as he moves up. The Exemplars are neat because for each one that dies, it adds +1STR and ARM to the survivors. There's like, six in a unit? The last guy is basically a light warbeast. They're a pain. Not so much as the dudes with self-sacrifice, but still a pain. Reznik is still activated, and he puts Iron Aggression on the Reckoner (I believe), and camps. The Avatar generates a whopping 4 focus (turn 1...) and runs. There's an upkeep token next to him, so I feel like he gazed, but I'm not sure if he can gaze and run at the same time, so it might not be gaze. The reckoner assaults forward, misses a Long Rider, and the Choir shuffles up and says I can't shoot their jacks. My Slag troll's shoulders visibly sag. But wait! There's a huge based model nearby that's not living! The giant portable organ is apparently not living, so the Slag's good to go. Madrak pulls in his fury, upkeeps Blood Fury on the Fenns. The Impaler moves up, far strikes the Slag, and pitches a spear at someone but misses. The Slag walks up, throws at the Vessel, ends up hitting twice, boosting damage, and taking the Vessel down to like, 5 boxes. Not bad. The Fenns Minifeat and charge, and apparently the Exemplars are all fearless, which is cool, but my Fenns still pretty much tear them apart. I don't manage to kill all of one unit, but I kill a good chunk of two of them. My favorite was the far right Fenn that killed the Wrack, and got 2 more Exemplars because of it blowing up. And my Fenn lived. Ha. However, because of the Vessel of Judgement, two exemplars martyr, and kill 2 fenns who fail tough before the exemplars themselves die. The Long riders shuffle across, and one charges the Avatar, doing 8pts of Damage and tieing them up for a bit. Sons of Bragg press forward, and Madrak walks up, drops Warpath, camps 2. The KSB moves up, pops aura, no continuous effects, and Janissa pops the wall again. Not a bad turn. The counter strike is coming though. Reznik upkeeps both spells, and the Avatar generates 2 focus. My opponent starts by measuring control, but he's outside of 12'' for the assassination with Maddie. So, an Exemplar uses it to move up, and the Vessel moves up and shoots my Kithkar, boosts (by 'cutting' itself) and kills the fenn UA, but only just fails to get the Kithkar. The Exemplars counter attack, and takes the Fenns population down to about 5, including the drummer. Incidentally! Did you know the Drummer has takeup? So I could park the guy next to Madrak, and when he grim salvations, another Fenn can run to take his place if he's within 3''. Pretty stupid. Madrak can never die. "Camp Fury? What for!?" he announces loudly to all of his nervous friends nearby. The other Exemplar unit moves up in a charge run and tie up one Longrider, and kill the one engaging the Avatar. The Avatar then walks up, and gazes. The Reckoner assaults forward again, and kills a Long Rider. Then a Vassal gives him another shot, and he shoots my Long Rider leader, but he toughs. First Tough of the game. Dartan runs up and does Stone and Mortar, stance, I think, creeping up on my flank. Reznik moves up, camps focus. I think really hard about assassination this turn with Madrak. I suspect I can tide of death up to the caster, but it doesn't seem like it'll work so I go a different route. The Fenns kill a few Exemplars, which in turn kill them back because of the Vessel. One of them even finishes the Kithkar. I drop Blood Fury, and Warpath both. 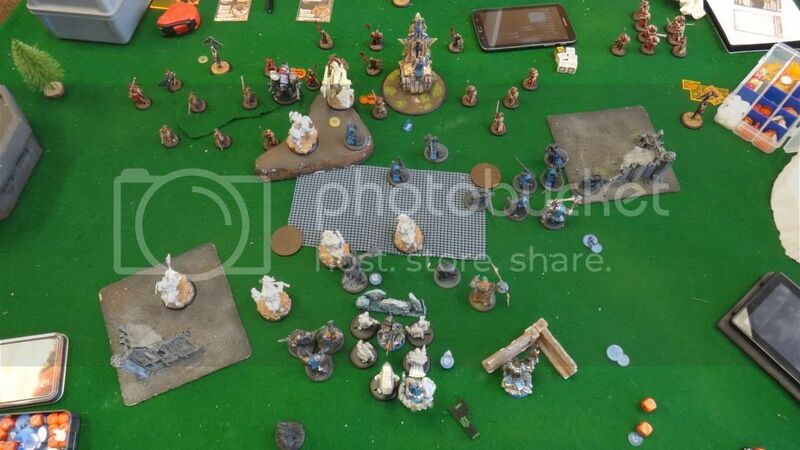 The Long Riders want to charge lots of things, but the Avatar of Menoth says no. So the Slag lobs rocks at it, takes it down pretty respectably, but not quite enough. Moses exalts Madrak, and Madrak walks up, puts Blood Fury on the Long Riders, and puts a fury to the stone, camping 2. Everyone else does the normal truffle shuffle, e.g. KSB moves, stations around Madrak, camps, and Janissa walls up. The Long Riders go ahead and charge the Avatar and kill it, with ease. The Sons Assault forward, or really, just Tor, who sprays Dartan and cranks the damage rolls with Fervor, killing the noble paladin, my favorite dude in Menoth (granted, the rest of the faction sets such a low bar). What I should have done is kill the Avatar with the sons of Bragg, and charge the Long Riders into other stuff, but I didn't. My PG pointed out that I could have put 3 or 4 ranged attacks into Reznik this turn with feat (Two thrown axes and 2 spears from the Impaler,), and finished him off with a Long Rider charge, but that didn't occur to me. Should have, it didn't. Once I figured out I couldn't Tide of Death around the place, I didn't want to assassinate anymore. The axer, which incidentally, has done 0 this game, moves up into the zone and gets ready for late game carnage. The Storm troll would have been better for this list. Even Horthol... Or hey! Fell Caller and Chronicler, but no. The Fenns charge, one getting into the Vessel of Judgement, and ending it's sad existence. The rest work on killing more Exemplars, which are now getting pretty ridiculous as far as ARM and STR. Little 1pt paladins all over the place. Not sure how that works. I assume they just put on all the armor their buddies had, and use their steroids too. The Impaler moves over to protect Madrak from a direct charge and throws at something insignificant. Should have tried to crit smite the Reckoner, but I didn't. I've got 2 fury on Madrak, but I don't want to go over too much, even though I'm pretty sure Reznik is feating this turn. Reznik is in trouble. He drops Iron Aggression since the Avatar is dead, and pulls a focus from his wrack which decides to esplode. Maddie lets him move up, but he really doesn't think he can get past the Impaler, AND kill Madrak enough times to get past like, 5 grim salvations. So he feats, and walks over to the wreck of the Avatar for cover. He kills a Long Rider, and wracks him up, then puts Iron Aggression on the Reckoner. The Exemplars move in and kill a few more Fenns, but they're both running low in numbers. One of them gets into the remaining Long Rider, the leader, and forces a tough check again, which he passes somehow. The Reckoner assaults forward, and forces a Tough check on my Son of Bragg with reach, Wrathar. Then he whacks him, kills him, whacks Tor, and kills him too. Now, I can assassinate. Fenns Vengeance around, I drop Blood Fury. The last Son of Bragg charges the Reckoner and does ok. The stones activate, move around. They lost all of their fury in the feat, so I have nothing left to pop, and I'm certainly not giving them any with Madrak. Madrak charges, and has plenty of distance to Reznik. He boosts to hit, hits, does solid damage. Buys, hits, buys, hits, and kills Reznik. 1. No Fell Callers and Chroniclers was dumb. I could have really screwed with some Errants if I'd had "Hero's Tragedy" (Enemy model is KD if it hits model in unit), and some +2 attack rolls would have been cool. Overall, I didn't miss them too much, but I very easily could have, and they most certainly would have done more work than my Axer did. 2. I had a solid assassination that I passed up. I didn't feel like I really needed to take it though. 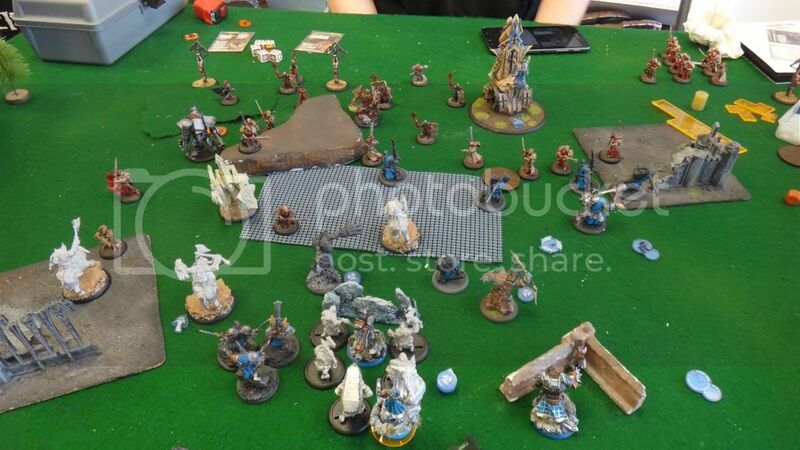 I was attritioning halfway decent, and my opponent had actually scored a point earlier when he killed an objective with an exemplar (forgot that) but I still felt like I was cutting down his forces well enough that I didn't need to worry about it too much. The reckoner might have been an issue, but if I hadn't felt confident on the assassination, I 1) wouldn't have gone for it and 2) would have moved the KDed longrider first to engage the Reckoner, getting another attack on him. Not enough to kill, but tie him up. Eventually it would have basically been Madrak vs. Reznik, but I still had an Axer left, a few Fenns (A force to be reckoned with on Blood Fury), and I still had a full unit of Kriel stones (Blood Fury makes them pretty decent too), Janissa (who has an AP attack, believe it or not), against Reznik, part of a Reckoner, a few Exemplars on the opposite side of the map from my Fenns, and Choir. I was doing decent, as long as I didnt' let Reznik kill me, which would have been difficult regardless. 3. I screwed on the assassination run, not getting Blood Fury onto Madrak with the Runebearer, that was dumb. Worked out, I had plenty to spare, because I could feat, kill the two Exemplars within reach of Madrak and get 2 more fury, plus another attack on Reznik and finish him off. Overall, it went fine, but I felt dumb for not getting blood fury. Anyways, hope you enjoyed the game. 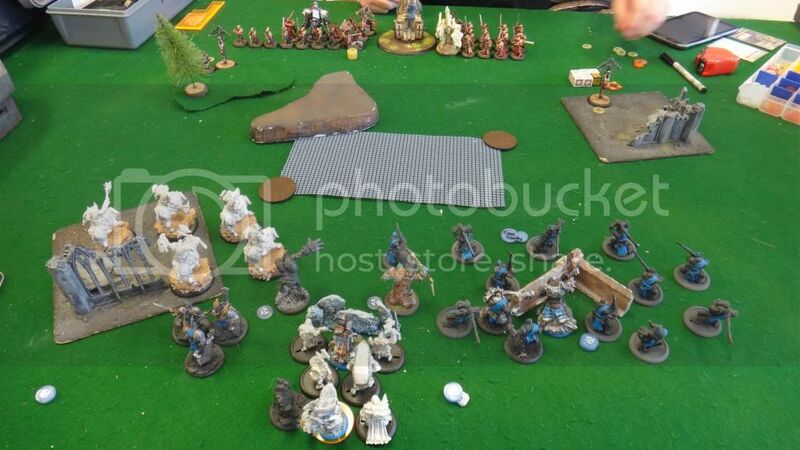 I have one more, eReznik (The new Battle Engine Caster from Vengeance) vs. eDoomy. Comments, crits, all welcome.